The Piano Encyclopedia Blog – The Piano Learning Revolution » Musicians are not born – they are made. Discover The Logic Behind Music! Musicians are not born – they are made. Discover The Logic Behind Music! It’s been a while since we posted on the blog, as we have been writing constant short news updates in our chat room -but today, I am writing to you today to share some really exciting news! After almost three years of intense development with the help of more than fifty collaborators – which included pianists, writers, editors, graphic designers, and developers from different corners of the world – I’m proud to announce that our Digital Home-Study Course: “The Logic Behind Music” is finally ready and looking truly amazing. My team and I have taken the lessons, the animations, the graphics, and the presentation to perfection, paying great attention to detail. This course has really become everything we dreamed about! With this course, the history of piano learning has changed forever. THE PIANO LEARNING REVOLUTION HAS BEGUN! Throughout history, revolutions have changed the way we think, live, and learn. The leaders of revolutions have long been applauded for their bravery and determination; for using their ideas to better the lives of everyone around them. Today, my team and I are adding a new chapter to the book of music history by presenting our revolution to the conventional piano-learning method. Our method is not based on rules, but on logic and understanding. We don’t intend to teach prospective pianists to play without understanding the music. Opposite to the conventional piano-teaching methods, our techniques do not enslave the students with a set of complex rules that only a few can understand, and that only professional musicians are able to master after a lifetime of dedication to music. Mastery of the art of music composition and improvisation will no longer be limited to the skillful and gifted musicians who are able to devote their entire life to music and piano learning. EVERYONE will be able to enjoy playing, improvising, and composing on the piano -and that’s what this revolution is really about. The Logic Behind Music’s Main Lessons, with all of the music secrets that helped each of the musicians and pianists on our team reach a new level of music understanding. The Logic Behind Music’s Four Piano Practice Booklets full of enriching exercises, so you can take all of the music concepts you are learning into practice with your piano or keyboard. 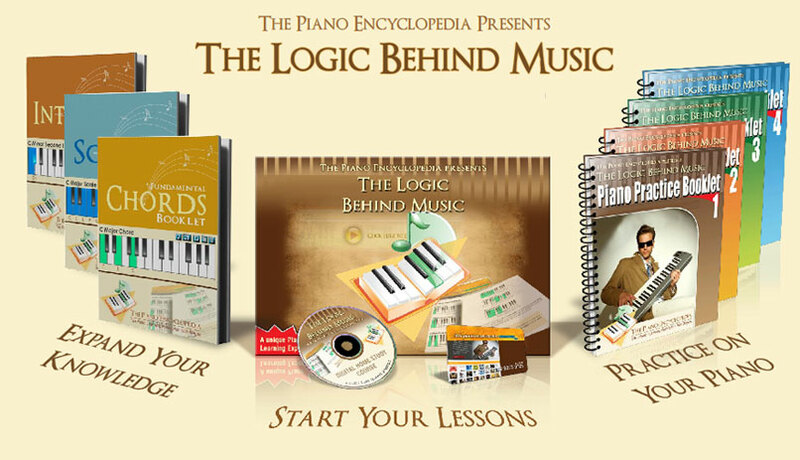 The Logic Behind Music’s Three Reference Books: Expand your knowledge with the Multimedia Books, master all of the fundamental Intervals, Chords and Scales, and gain access to hundreds of interactive Piano reference charts. A Gold-Membership Account in The Piano Encyclopedia’s community, so that you can access Premium Exclusive Areas, ask questions, share your progress, parcipate in music contests, and interact with other musicians and pianists that are taking the same lessons as you. Virtual Piano Keyboards and exclusive Piano Encyclopedia technology, so that you can follow the lessons and practice even if you are far away from your piano or keyboard. The most common problem we’ve encountered is that most pianists are limited to just reading and playing music. That is, most pianists are just ‘interpreters’ and lack the necessary skills to be able to improvise or compose music. What we recognized is that it is not the students’ fault… it’s actually the way they’re taught. Very few teachers know this, and very few private teachers actually teach this in a practical way. In my case, I spent more than ten years without much real progress, other than learning more and more pieces, which I would then forget as the years passed. Then I was shown some simple but powerful concepts that changed everything for me, and nowadays I just sit at the piano and improvise or create my own music. This is something I thought was completely impossible… something that I considered out of my reach no matter how hard I practiced… and no teacher would teach. We want to change this worldwide. We want to eliminate this frustration for every piano player out there. Eight months ago, we were (and still are) the first piano site on the Internet to release an eBook of more than twenty pages for free. We released our 111-page Music Fundamentals eBook as a gift to the Piano community. this is what differentiates average piano players and the exceptional ones. music sheets suddenly become so much more clear than ever before. I’m currently reading your report and I must admit it is fantastic! I’ve been studying piano for some years, giving up and starting again quite a lot of times. Your personal history is very similar to mine The project is a great idea and it will help a lot of people. “Hello. I have looked on different websites to try and find something that would help me on chords, and this was the best and easiest approach. My husband and I go to church, where everyone has some type of music ability. I’ve never been cordinated or very consistant in anything I’ve tried to play. “Thanks to you and to the whole team for this amazing project that will help a lot of	people to understand how music works! I thank you very much for this website, in my point of view I would say it will most likley contribute into the comeback and the revolution of the piano once again. Today, our Digital Home Study-Course “The Logic Behind Music” is finished, and we truly believe that with this course we´ll be changing how you learn on the piano. After so much work and dedication, I can tell everyone that this is really a dream come true for us. This couldn´t have been possible without all the people who contributed and believed that their vision of changing piano learning was possible, and dedicated their time and energy to work as a part of our team toward a common goal. And most importantly, this wouldn´t have begun without the support of the internet piano community: people who visited our site, offered us their support by leaving a message or comment, and subscribed to our site which gave us the energy to make this dream come true. For this reason, to thank all the followers of our site, we´ll be making all of our newsletter subscribers part of our special pre-release offer, which will allow them to access our Digital-Home Study Course at a special price before it’s released to the public. Since this course is now fully completed, we are now working on completely redesigning our site to honor all these years of development, and preparing everything for the official launch date – which will be announced upon the end of the pre-release. Exciting times have begun for The Piano Encyclopedia, and for all of the piano players around the world. On behalf of our team, I truly thank you for supporting The Piano Encyclopedia and I am proud to be sharing this thrilling news with all of our followers. P.S: If you are already subscribed, please know that all pre-releases will be occurring during the next few weeks (starting this week), giving priority to the followers who subscribed first. If you haven´t subscribed yet, but don´t want to wait for the official release date and wish to get our Digital Home Study Course at a special price before anyone else, make sure you join our newsletter now. (Click here to join our newsletter) We´ll consider you for our special pre-release price, depending on your subscription date. 17 Responses to Musicians are not born – they are made. Discover The Logic Behind Music! Thank you so much for the congratulations! All the team has put all their energy and dedication to making this possible. And I must tell you that I cannot help from staring and admiring our creation! We managed to merge everything in one course: the lessons, practice booklets, multimedia reference books, the interactive piano-charts and interactive technology we always mentioned, and a complete 2.0 fully featured web community integrated into the product that combines exclusive The Piano Encyclopedia’s technology. So this is really a dream come true for all of us and we are really happy! Stay in touch, I’ll be posting more news soon and we’ll be starting the pre-releases at the end of this week to thank everyone that has gave us their support, subscribed to our site, left us comments, and gave us the energy to make this possible! In this way we want to thank everyone, and subscribers will be able to get a copy before anyone else at a very special pre-release price. We’ll be giving priority to the first subscribers and then expanding to the whole list. Congratulations to you and all team !!! Your contribution to pianists worldwide will make history ❗ . Comparing with other options I found out that your encyclopedia, could be, probably, the number one reference worldwide. This is the best product i have seen online. You have taken music making to a whole new level never done before online. I strongly recommend this product to everyone who has just begun learning or has been learning for a few years. They will suddenly begin to understand what they are playing. Congrats Rod to yourself and your team. It’s my pleasure to have you in as one of the first customers of our unique piano learning experience! Your comment makes everything worthwhile!! ¡¡Muchas felicidades por su logro!! Ojalá sea ampliamente difundido y beneficie a quienes aman la música. Thank you so much! I really appreciatte your comment and your support. We are making the pre-releases in groups, giving priority to the subscribers that have subscribed first, as they are the ones that have been waiting longer. However, to thank you for your comment I´ll include you into the next pre-release sales-round so you can be one of the first to enjoy The Logic Behind Music! This is a very good news. Congratulations! I’m really curious about the final product, as the first lesson we could enjoy time ago had a very high quality. It’s great to see you around. As promised I have just sent you the VIP Pre-Release Invitation! I start with Music Fundamentals few days ago, and tell you, is easy to learn and know then, yor examles an camparations of stress and nice of sound its real, I practice right now so… thanks a lot. Sorry for bad english. I just discovered your site yesterday, and I’ve read through the Music Fundamentals booklet. I’m a total newbie at music (except for listening to it) and as a computer geek and programmer I like to understand the system behind things. I found the booklet an excellent resource, and am looking forward to this course, especially learning to compose my own music, as opposed to learning to play a lot of boring tunes without knowing how they are made. The language was clear and precise, and everything was explained thoroughly and understandably. Great stuff!